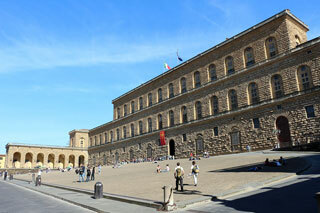 The Palazzo Pitti, in English sometimes called the Pitti Palace, is a vast, mainly Renaissance, palace in Florence, Italy. The core of the present palazzo dates from 1458 and was originally the town residence of Luca Pitti, an ambitious Florentine banker.The palazzo is now the largest museum complex in Florence. This article uses material from the Wikipedia article "Palazzo Pitti", which is released under the Creative Commons Attribution-Share-Alike 3.0 License.